10 years ago today Little Man was born. He has filled our lives with unexpected joy and surprises. His mind has always been very busy and he definitely keeps us on our toes. He can be so mischievous, but then turn around and do the most thoughtful things. Although it is his actual birthday we decided to have a family celebration for both children today. It started with a special breakfast. Haldan made Little Man a giant pancake and Pokey a large pancake comprised of several smaller flower shaped ones. Then they finally got to open presents... the much anticipated event. Litte Man had this idea some time ago to get a large box and hide inside it and jump out for Pokey. I didn't have a box, so he took it upon himself to find one at a neighbor's and then tied it to his scooter and dragged it home. He didn't have time to wrap it or decorate it like he would have liked, but he had a blast jumping out of that box. Haldan and his Dad carried him up the stairs and then Pokey got to open it. He was so excited to see her face and she was so disappointed to see his. The moment was priceless. Wish I would have captured it on video. Little Man gave Pokey a webkinz, some money, and a very sweet card. Pokey gave Little Man $10, which is very generous and a little out of character for her. After she had wrapped it I suggested maybe she do less, especially considering it was the $10 that she had lost and had just found again. She wanted to do the $10 though. But then the next day she wanted to change it from $10 to 25 cents. I had to laugh. But in the end she actually gave him all $10. Other gifts included: legos, pet shops, and books. Then the children wanted to feed the ducks and catch a frog. We went over to Ellis and they couldn't have picked a warmer day. It was only 89, but with the humidity the temp was 101 degrees. It felt pretty accurate. We have had such a mild summer so far that we have become a little spoiled. 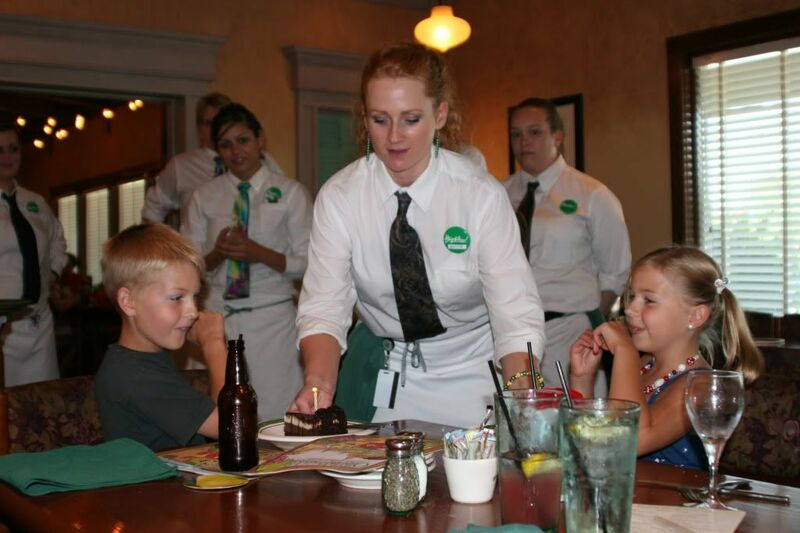 The kids agreed upon the Olive Garden for dinner where they were sung to and received cake. To finish the evening we went to Planet X and the kids enjoyed some put-put. It was a very full day and I'm looking forward to my bed, hopefully soon. hahahaha LOL I thought that was hilarious!!!! 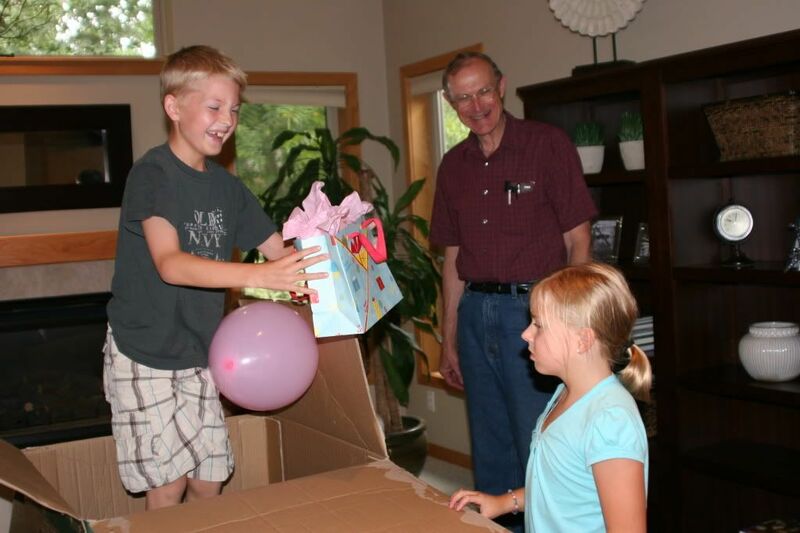 What a creative mind, and so fun that Haldan and Grandpa went along with it, so he could pull it off!! Clever boy!!! I hope both have/had a great birthday!!! :) Sounds like you guys had fun-filled day, yesterday :) Hey so I saw a baby girl today, that looked just like Camille! It was so weird considering I dont think I've ever seen Camille's baby pics, but this little girl looked just like Cam, but as a baby. Funny! !